Posted on 21, March 2019 by EuropaWire PR Editors | This entry was posted in Automotive, Germany, Industrial, News, Politics, Science, Technology, Transportation & Logistics and tagged 21st Technical Congress in Berlin, AI, Alexander Kraus, artificial-intelligence, automated driving, automated vehicles, automation, automotive industry, connected driving, Connected Vehicles, Continental Teves, continuous servicing, digitization, Dr. Andree Hohm, Dr. Joachim Damasky, driverless car, Driverless mobility, Fourth Industrial Revolution, fully electric powertrains, German Association of the Automotive Industry, heterogeneous data architecture, Industry 4.0, mobility, Prof. Peter Gutzmer, Robert Bosch GmbH, safety checks, Schaeffler AG, Siemens Industry Software GmbH, Thorsten Freund, TÜV SÜD Auto Service GmbH, Ulrich Schrickel, VDA. Bookmark the permalink. BERLIN, 21-Mar-2019 — /EuropaWire/ — High-level stakeholders from the industry and politics comment and share their views on mobility, transport, logistics and production, in both plenary and specific technical sessions during the second day of 21st Technical Congress in Berlin. The gathering is organized by the German Association of the Automotive Industry (VDA). Key topics discussed were artificial intelligence (AI) and and how it contributes to automated driving, world trade, commercial vehicles and future production, among others. Brexit remains major topic as well as the transport of tomorrow and how is digitization changing production. According to VDA Managing Director Dr. Joachim Damasky the artificial intelligence (AI) is playing a very important role in automated driving. Commenting on connected and automated driving, Dr. Andree Hohm, Director Driverless Mobility at Continental Teves AG & Co. oHG, finds the reliable detection of the vehicle’s environment to be a key foundation for automated driving. Alexander Kraus from TÜV SÜD Auto Service GmbH thinks simulations and data-based methods must be integrated during vehicle development and enshrined in global standards. 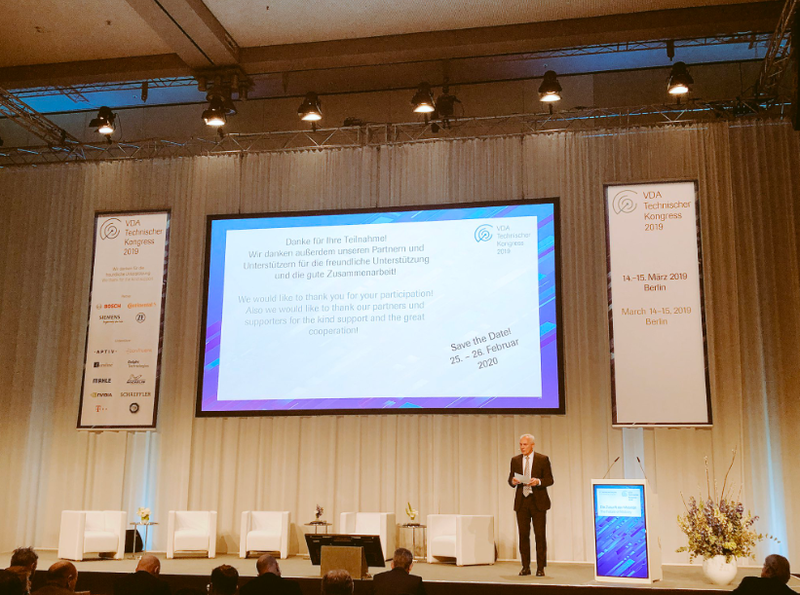 Furthermore, artificial intelligence (AI) and generating knowledge from data are the drivers of the fourth industrial revolution, according to Ulrich Schrickel from Robert Bosch GmbH. Commentaries made by key stakeholders during the second day of the congress. Dr. Damasky underlined the fact that manufacturers and suppliers drive forward the development of AI systems with the required caution.